Firstly I'd like to apologise for there being no article last week - I got called away. Earlier this month (September) I decided that I was going to break down the 'brick wall' I had for my 3x great grandmother, Elizabeth Brown, - she had stumped me for years as well as other descendants tracing the family origins to her. This gave me a time frame to work with as well as a county. From previous research I had drawn a blank with Ruttleback so I tried to find some suitable similar place names. I found 3 places in Cumberland (now part of Cumbria) which ended in 'beck' so I wrote them down and looked in those places. They were: Caldbeck, Kirkcambeck and Whitbeck - of which the most prevalent one for 'Browns' was Caldbeck at the very north of the Lake District. However, that didn't lead me to any stand out Elizabeth Brown. So I carried on searching and decided to note down any possible Elizabeth Brown born around the same date that had the father George Brown. I narrowed it down to 6 possibilities and then further down to 3 by dismissing 2 due to finding them in the 1871 census as a Brown with her parents in the same place (no way near Hexham) and one as she died in 1866 - in Hexham. Looking at the siblings names one in particular stood out - a Thompson Brown. Thompson is not a common forename and I know my Elizabeth had a son called Thompson Bibby (who is my 2x great grandfather). This Elizabeth was born in Patterdale, Cumberland before moving to Haltwhistle, Northumberland around 1857 which is where Thompson (her brother) was born in 1859. 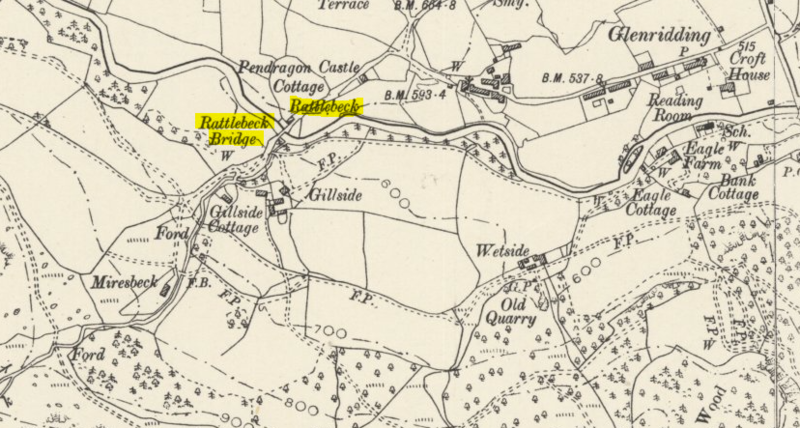 I decided I would look at old maps, from the National Library of Scotland, and saw near Glenridding (neighbouring village of Patterdale) was a small place, probably of only a few houses, called 'Rattlebeck'. Could this be the Ruttleback I was looking for? The more I looked into it the more certain I became that this was where my ancestor was born - it fulfilled everything I knew of her also. I had finally broken down this brick wall at which many people stumbled - I then found her baptism, in Patterdale, on the 27 October 1850 to tidy it all up. It also turns out that Elizabeth's mother's maiden name was Thompson which I guess is why they started using it as a forename.